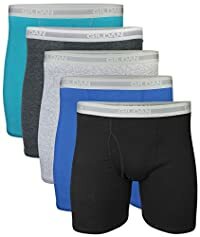 Men's Premium Soft Cotton Underwear Gildan Boxers - Plush Non-Binding WaistBand Briefs..
Specifics/Features — Men's high quality underwear boxers.. Designed with modern fit.. Comes with plush non-binding soft waistband that keeps its shape even after washing.. Low profile leg bands.. Flat lock seams.. Made with premium soft cotton for all day comfort.. Solid colors are made with 100 percent cotton.. Heather colors are made of 90 percent cotton and 10 percent polyester.. Available in different sizes and colors ..